Water Rights. Tax, Assessment, Abatement. Conflict of Laws. Discussion by KNOWLTON, C. J., of the development and the present condition of the law in this Commonwealth with regard to mill privileges. as a means of furnishing power at the corporation's power house in Rhode Island, and the corporation petitioned to have the tax abated. Held, that it would have been improper to tax the value of the use of the power in Rhode Island separately as water power existing and applied there, but that the land owned by the corporation in Blackstone should be taxed there with all its elements of value, so much of the value of the water power in Rhode Island as was imputable to the real estate in Blackstone being considered, as well as the uses to which the power could be put in Blackstone. A list of a taxpayer's estate liable to taxation, intended in good faith to be filed in accordance with R. L. c. 12, s. 41, entitles the taxpayer to be heard upon a question of abatement under s. 74, although the list contains unintentional omissions and inaccuracies. PETITION, filed in the Superior Court for the county of Worcester, October 1, 1906, for an abatement of a tax assessed to the petitioner by the respondent for 1905. The case was referred to an auditor. His findings of fact are stated in substance in the opinion. Annexed to his report was the following plan. "With respect to this privilege, however, the petitioner contends and asks me to rule (a) that on the foregoing facts there is no 'privilege' in Blackstone which is there taxable, (b) that the dam, canals, pond, trench, fall, and the water of the river constitute a water power which has been annexed by its owner to the mills in Rhode Island and can only be taxed there, (c) that any value which any of said structures or land occupied by them for ponds, canals, etc., may have is purely due to them as component parts of the system by which the water power in Rhode Island is developed and is to be referred to the mills and land in Rhode Island and is there taxable, (d) that the value of said dam and other structures and the canals and ponds is merely nominal if referred to that part of the company's real estate which lies in Massachusetts. "The respondents contend, however, that its assessors had the right to tax so much of said unit (consisting of dam, canals, pond, and a part of said trench as lay within the town of Blackstone) as a part of its assessment upon 'village land and privilege including dam . . . for the development of water power sixty-one and three-eighths acres' at their proportionate fair cash value, having reference to the use made of them by the petitioner in creating and producing power in Rhode Island and having reference to the fair cash value of the entire unit (i. e. the entire privilege), as used in Rhode Island, and that in arriving at this value I should take into consideration the enhanced value, if any, which the structures have by reason of their constituting a part of a privilege developing a valuable water power. development of water power sixty-one and three-eighths acres,' said land, etc., is to be taxed at its fair cash value with reference to all the buildings thereon and in use together and having regard to and including the value of the dam, the canals, the pond, and so much of the trench as lies in Massachusetts with reference to their capacity for valuable use, not as component parts of a unit system developing power on the company's wheels in Rhode Island, and not assigning any value to them attributable to the water power actually developed on said wheels or to the money value of said water power either for use by the owner of the Rhode Island mills or for sale to others by said owner and not dependent upon or including any part of such value." There was a hearing before Gaskill, J., without a jury, upon the pleadings and the auditor's report, and he pro forma adopted the findings of fact and rulings of law of the auditor, and reported the case for determination by this court. T. H. Gage, Jr., (F. F. Dresser with him,) for the petitioner. J. R. Thayer, (H. H. Thayer with him,) for the respondent. and at the new power house it was thirty-two feet. 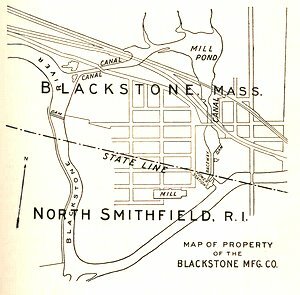 The assessors of the town of Blackstone taxed the property in that town, including the dam, the pond, the canals and the trench, in reference to its value as a means of furnishing power, not only at the old mills, but also at the petitioner's new power house across the State line in Rhode Island. The petitioner contends that the power is annexed to its mill in Rhode Island, and that the corporation is not taxable in Massachusetts for any value in the land or water or structures, by reason of their use or their adaptability to use as a means of furnishing power to run the mill. The principal question before us is, Where and on what principles is this property taxable? The petitioner rests its contention largely upon the case of Boston Manuf Co. v. Newton, 22 Pick. 22, the doctrine of which is stated in the headnote as follows: "Water power for mill purposes, not used, being merely a capacity of land for a certain mode of improvement, cannot be taxed independently of the land." The remainder of the headnote is in these words : "Where a dam extended across a river, the thread of which was the dividing line between two towns, but the water power created thereby was applied exclusively to drive mills situated in one of the towns, it was held that the water power was not subject to taxation in the other town." The opinion in the case is less than half a page in length. It barely states the proposition with which the headnote begins, and adds that the power had been annexed to the mills, which were situated wholly in the town of Waltham, and that it could not be taxed in Newton, in which were the land and water to the thread of the stream on the other side. This case has been treated as settling the law in Massachusetts that the possibility of deriving power from the water of a stream, before the water is appropriated or used for furnishing power, is not taxable property by itself alone, and that when water is appropriated and used for power, it is, as between different owners and municipalities, taxed with the property to which it is applied. It is to be noticed in this case that the water power is dealt with only in connection with an attempt to tax it as a distinct subject, apart from the land in Newton over which the water flowed, and from the part of the dam which was in that town. The tax upon the dam, as well as that upon the land, was held to be rightly assessed. In Pingree v. County Commissioners, 102 Mass. 76, a tax upon a dam and land in Windsor, used to make a reservoir to furnish power for mills in Dalton and Pittsfield, was held rightly assessed in Windsor on their value for use in producing the power. estate with which it was used, and the owner's only liability was to make compensation to any other person whose property was damaged by the use. Water power as a distinct element of value that could be taxed apart from the land, or that must be paid for as between different riparian proprietors, was recognized only in connection with the property to which it was annexed by the structures and appropriation with which it was applied to the mill. The nature of this legislation, in reference to the purpose of its authors and to the constitutional questions that arose under it, has been fully considered by the courts. Lowell v. Boston, 111 Mass. 454, 464, 467. Turner v. Nye., 154 Mass. 579, 582. Otis Co. v. Ludlow Manuf. Co., 186 Mass. 89, 95. While originally there was some doubt as to the grounds on which it could be sustained under the constitution, it is now settled by this court and by a unanimous decision of the Supreme Court of the United States, that the validity of the legislation does not depend upon the right of eminent domain, but upon the right of the Legislature to regulate the use of property for the best interests of the owners and of the public, when different persons have separate rights which have a common relation to certain property, such that a use of it by one owner will interfere with a like use by another owner. Besides the cases above cited, see Head v. Amoskeag Manuf. Co. 113 U. S. 9, and cases cited in the opinion. The same principle, with variations, is applied to legislation on other subjects. Wurts v. Hoagland, 114 U. S. 606. Fallbrook Irrigation District v. Bradley, 164 U. S. 112, 163. Hudson County Water Co. v. McCarter, 209 U. S. 349. Georgia v. Tennessee Copper Co. 206 U. S. 230.
this Commonwealth for taxation interests in real property situated in another State, and it does not transfer from this to a neighboring state valuable rights in real property situated in Massachusetts. In determining what rights of property are taxable in Massachusetts under the conditions that exist in this case, we are not to consider a statute enacted merely to regulate the rights of riparian owners to property in our own jurisdiction. From this point of view, the question before us is, What is the value of the petitioner's property, having reference to any and all of the uses to which it is adapted? The land of the petitioner, through which the river flows in Massachusetts, descends along the line of the stream in such a way as to give an opportunity to create a valuable water power. The flow of the water and the fall are natural elements of value in the real estate, which would be taken into account as between buyer and seller in agreeing upon a price for the property, and by assessors in fixing its value for taxation. The dam, canals, and other structures have been constructed to make these natural features of the real estate valuable. They are all to be considered together, in connection with the land and the flow of the stream, in determining what the whole is worth. They have all been appropriated and put to use in furnishing water power as a part of a unit which constitutes the petitioner's mill privilege, and which includes about twenty feet in length of trench and nearly three feet in height of fall in Rhode Island, before reaching the place where the power is applied to the wheels. If conditions in Rhode Island were disregarded, the value of the property in Massachusetts, including with the land and water the fall which the land furnishes, and the dam, pond, canals and other appurtenances, would be estimated in reference to the most profitable uses to which it could be put, and especially its use to furnish power to a mill in Massachusetts, situated near the line of the State of Rhode Island. Inasmuch as it has been joined to the property in Rhode Island and used with the slight additional fall there to produce a single unit of water power, and inasmuch as it is found that this is the most valuable use to which it can be put, there is no reason why its value should not be considered in reference to the use to which it is adapted, and which is now made of it in connection with the property in the other State. The State of Maine was formerly a part of Massachusetts, and its statutes and decisions are very similar to those of the parent Commonwealth. In Union Water Power Co. v. Auburn, 90 Maine, 60, the decision in Boston Manuf. Co. v. Newton, 22 Pick. 22, was followed, although Mr. Justice Emery wrote an able dissenting opinion. In Saco Water Power Co. v. Buxton, 98 Maine, 295, and Penobscot Chemical Fibre Co. v. Bradley, 99 Maine, 263, it was held that, while water power as a distinct subject for taxation could not be assessed except in connection with the property with which it was used, the land and fall and dam were properly assessable in reference to their value as a means of producing power. In the first of these two cases this language was used in the opinion : "We think that in so far as this land was made more valuable by the stream and fall, so far these were properly to be considered in the valuation of the land. . . . It was the land and the dam, situated as they were, with a capacity to hold the water of the stream and to create power. By the terms of the assessment water power was not assessed and the water was not assessed. The 'privilege was assessed.' Its value might be greatly enhanced by the existence of the water and the means of creating the power." In Bellows Falls Canal Co. v. Rockingham, 37 Vt. 622, the assessment was upheld, and there is nothing in the opinion that conflicts with our view. In none of these cases was there any occasion to consider the law to be applied where the pond, the head, and the fall which produced the power were all or nearly all in one State, and the power was applied to the wheel in an adjoining State. In New Hampshire the subject has been considered on general principles, seemingly without reference to the Mill Acts, and it is held broadly that the elements in the real estate which create the power are to be treated as creating its value, and that the whole is to be assessed in the town where these are situated, without reference to the location of the mill where the power is applied. Cocheco Manuf. Co. v. Strafford, 51 N. H. 455. Winnepiseogee L. C. J. W. Manuf. Co. v. Gilford, 64 N. H. 337. Amoskeag Manuf. Co. v. Concord, 66 N. H. 562. These cases strongly sustain the conclusion which we have reached in the present case. So too does Quinebaug Reservoir Co. v. Union, 73 Conn. 294.
relates to the damming of water in this State, to be used at a mill or mills in another State, is Farmington v. County Commissioners, 112 Mass. 206. In that case the taxation in Massachusetts was upheld without much discussion of the reasons, other than those founded on the pleadings, although it appeared that the valuation of the reservoir and dam was a considerable sum, fixed in reference to their value for holding back water for the production of power which was nearly all owned and used in Connecticut. A part of the evidence objected to was held "competent to show the value of the reservoir by reason of its capacity for valuable use." We have been referred to no case in which elements of value in real property existing in one State were left untaxed there, and were taxed in an adjacent State where they were put to use. Suppose the owner of land in a neighboring State should purchase a right in land in this State, covering most of its value for use, and leaving the fee of the land unpurchased and almost worthless, and should attempt to annex it as an easement to his land in the other State, would he thereby deprive this Commonwealth of the right to subject the whole land in Massachusetts, including the purchased right, to taxation? Plainly not. If the authorities of the neighboring State should assume to tax the supposed easement in the land in Massachusetts, and to enforce the collection of the tax by a sale, on what principle could they conduct a sale of the easement in Massachusetts and create a title here under laws enacted only for their own jurisdiction? In the case supposed, the whole property in this Commonwealth would be taxable to the general owner, or to the person in possession. It would not be the duty of the assessors to attempt to discover what interests or estates had been carved out of it. If the collection of the tax was enforced by a sale of the property, the whole would be sold, including outstanding easements, and the purchaser would acquire a perfect title, subject only to redemption by any owner having an interest in it. Hunt v. Boston, 183 Mass. 303. Abbott v. Frost, 185 Mass. 398. McLoud v. Mackie, 175 Mass. 355.
real estate and sales for the collection of taxes when there were easements upon the taxed property or easements annexed to it, and when both the dominant and servient tenements were within the Commonwealth. This statute changes the law as to easements in such cases; but it has no application to taxation or the collection of taxes upon property near the boundary line of the State, when a beneficial use of land in one of the States is made in connection with land in the other State. Its enforcement in reference to such property would be impossible. In the present case no easement has been created, but the land is held, with its appurtenances and all its natural qualities, by a single owner. It should be taxed to the petitioner, with all its elements of value. Among these are the right to use the flow of the water in connection with the fall of the stream to produce power, and to sell it for that purpose, either to be used in Massachusetts or to be carried into Rhode Island and used with an additional fall there. The use in Rhode Island is not to be taxed separately, as water power existing and applied there, but all the elements and qualities of the real estate which unite to produce the water power in Rhode Island and which combine to give it value there are to be considered. In determining the value of these features of the real estate in Massachusetts, the uses to which power could be put in Blackstone are to be considered, and the uses to which it is put in connection with the additional fall and the structures in Rhode Island are to be regarded. Lowell v. County Commissioners, 152 Mass. 372. 445, 446, 447. Western Union Telegraph Co. v. Attorney General, 125 U. S. 530. Massachusetts v. Western Union Telegraph Co. 141 U. S. 40. Taylor v. Secor, 92 U. S. 575. We are of opinion, under the facts found by the auditor, that the list [Note 1] filed by the petitioner was sufficient to entitle it to file a petition for an abatement. The list was filed in good faith, and the only important omission in it is found to have been made innocently. Great Barrington v. County Commissioners, 112 Mass. 218. The findings of the Superior Court should be set aside, and the value of the property in question should be determined, either by a recommittal to the auditor or otherwise, in reference to any and all uses to which it is adapted, including the furnishing of power to be used on the petitioner's wheels in Rhode Island. [Note 1] With regard to this matter, the auditor reported : "The petitioner was a foreign corporation and there was no evidence before me that the assessors required such corporations to bring in lists of the real estate in the manner provided by statute. It did so, however, and included in or annexed to said list the following statement : 'The Blackstone Manufacturing Company makes this statement of its taxable property in the Commonwealth of Massachusetts, not admitting that the real estate as listed is actually worth the sum of $153,020 but, for the purpose of arriving at an amicable arrangement with the assessors of taxes of Blackstone for the year 1905. 'The respondent asked me to rule that 'the petitioner has not presented to the assessors of the town of Blackstone a list of its taxable property in accordance with the provisions of R. L. c. 12, and it is not entitled to an abatement in these proceedings.' I refused so to rule and ruled that the list filed by the petitioner with the assessors was in substantial compliance with the statute and that it was not thereby deprived of the right to an abatement in these proceedings if otherwise entitled thereto. "It was also suggested by the respondent in argument that the petitioner had failed to include in said list property for which it was properly taxable in Massachusetts, and the instruction prayed for is broad enough to cover this objection raised in argument. Whether or not it has so failed to include in said list property for which it is properly taxable depends upon whether or not the assessors had the right to tax the canal, pond and structures used by the petitioner in creating power under the circumstances hereinafter set forth, but, if they had such right, and if as a result any item of taxable property belonging to the petitioner was omitted from its tax list, I find that the same was honestly omitted in the belief that it was not taxable by the town of Blackstone."